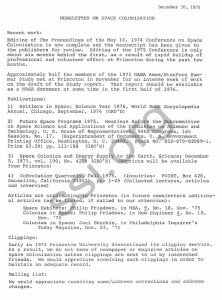 Editing of The Proceedings of the May 10, 1974 Conference on Space Colonization is now complete and the manuscript has been given to the publishers for review. Editing of the 1975 Conference is only about six months behind the first, as a result of rapid buildup of professional and volunteer effort at Princeton during the past few months. Approximately half the members of the 1975 NASA Ames/Stanford Sum­mer Study met at Princeton in November for an intense week of work on the draft of the Study report. That report should be available as a NASA document at some time in the first half of 1976. 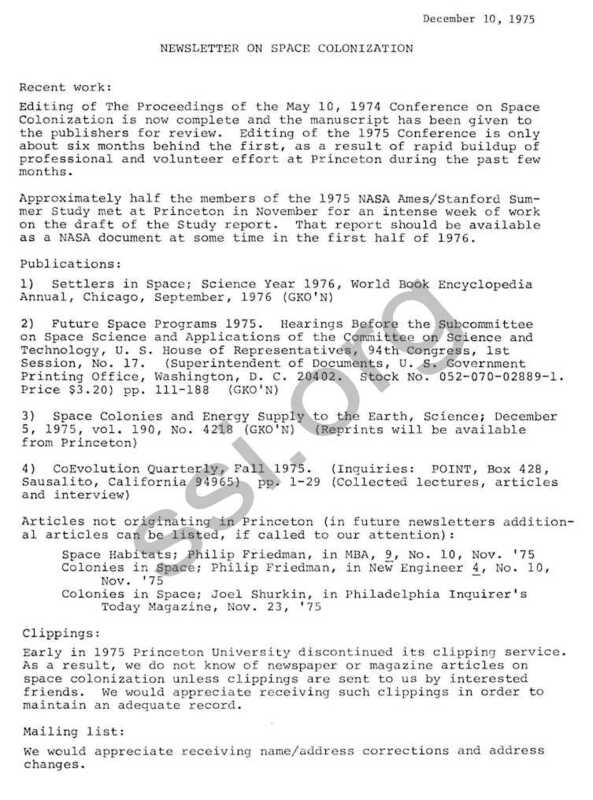 Early in 1975 Princeton University discontinued its clipping service. As a result, we do not know of newspaper or magazine articles on space colonization unless clippings are sent to us by interested friends. We would appreciate receiving such clippings in order to maintain an adequate record. We would appreciate receiving name/address corrections and address changes. People who wish to give lectures may wish to get in touch with us. Slides, reference documents and a 4-1/2 minute animated movie will be made available to lecturers by our office, at cost, if we are given adequate notice (2-3 weeks) of the need. replaced at Princeton by Dr. Brian O’Leary, former member of the scientist-astronaut corps, Assistant Professor of Astronomy and Space Sciences at Cornell University, Assistant Professor of Astronomy and Science Policy Assessment at Hampshire College in Amherst, Massachusetts and most recently Congressional Staff Member in Washington. Until the long-term level of support for research at Princeton is clearer, we are regarding Doctor O’Leary’s stay as temporary. The Princeton group has a job opening at the post-doctoral level, and would welcome inquiries from qualified candidates. The requirements are very stiff. Virginia Reynolds is now full-time with our group as a Research Aide. and is supplemented by an important group of volunteer workers, some at a considerable distance from Princeton. All members of the Princeton group, with the exception of myself, expect to be in residence at Princeton during the remainder of the 1975-76 academic year. I will be in the Palo Alto area in January, February and March, taking shifts on a high-energy physics experiment. During that time I can be available only rarely for lectures or interviews; any inquiries should be addressed to Princeton. As a matter of general policy, negotiations in Washington and elsewhere, held other than in public meetings, are not discussed in this newsletter. Work in progress (articles, research, etc.) normally is not discussed until its completion. It is a pleasure to report a half-year of intense and productive activity, in which the effort of volunteers in and outside Princeton has been essential.